Do you like the rainy season? I don't like it at all! My dogs don't like it either! It is so humid and difficult to go for a walk. But the good point is that all the flowers and vegetables have a chance to grow bigger and stronger from the rain. 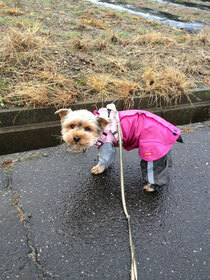 Daisy doesn't enjoy rainy days so I bought her a rain coat to keep her more comfortable while we walk. But soon we will be finished this rainy season and move onto our hot, hot summer....so maybe I should enjoy the rainy season while it lasts?